Whether it's Microsoft Excel, Windows or your new Chromebook, keyboard shortcuts are those combinations of keyboard strokes and clicks that you can use to do things a lot faster. If you've bought a new Chromebook, you might have noticed that some of the keys are missing on a Chromebook keyboard, like the Caps Lock, Page Up and Page Down buttons. Not to fear, in this list of the 15 most useful Chromebook shortcuts, I will cover how to turn the Caps Lock on, scroll up and down faster, how to take a screenshot and a couple of other nifty shortcuts. Ctrl + Alt + ? Shows a virtual keyboard which maps out all the available shortcuts. Ctrl + Shift + Q (twice) If you want to quit your session quickly, this shortcut signs out of your google account on the Chrome OS. Alt + Search Chromebook Caps Lock shortcut turn Caps Lock on or off. Most Chromebooks don't come with a dedicated Caps Lock button so you can use this shortcut to toggle it when you need it. Ctrl + Shift + L Lock the screen. Useful if you're going to leave your computer unattended and don't want anyone meddling with your session. Search + Esc Open Task Manager to see which applications or browser windows are hogging your Chromebook's resources. Opens apps that have been pinned to the shelf, which is the bar at the bottom of the screen. If Chrome is app number 0, the apps are numbered 1 to 8 from left to right. Take a partial screenshot of the current page by clicking and dragging the relevant section after you press the hotkey. Alt + [ Dock a window on the left. Dock a window on the right. Alt + Shift + N See your notifications. I hope you've found this article useful. 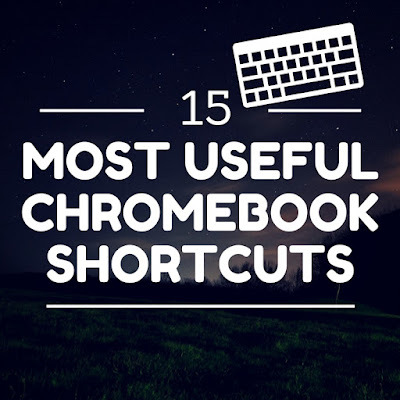 These are some of the most important shortcuts if you're using a Chromebook and aren't familiar with the Chromebook keyboard. There are many more shortcuts that you can use and they're covered on the Chromebook Help Page.